VIDEO: Meet Nancy & be inspired! Nancy Roscigno, a 47-year-old interior designer from Chapel Hill, North Carolina, lost over 20 pounds with her girlfriends. Here’s how she did it— and how you can too. What was your biggest challenge for losing weight? I had a very hard time making the right food choices. I grew up in a large Italian-American family and though I’ve been cooking since I was a kid, the food—and the portions—weren’t always healthy. What was the key moment you decided you wanted to lose weight? I wasn’t happy with the number I saw on the scale, and I felt a huge responsibility to provide good choices and be the healthy role model that I wanted to be for my kids (now aged 21 and 19). When I ate better, my family ate better. My girlfriends and I had been walking together in the neighborhood almost daily and we decided we should add a meal component to this plan. We knew eating healthy was just as important as exercising. How did you you lose weight? One of my walking partners, Julie, had been researching meal-delivery programs, but the cost and the potential that delivery dinners could be loaded with processed ingredients or not very tasty was a concern. And then—lightbulb moment—we had an idea: what if, instead of paying for ready-made food from a company, we prepared healthy dinners for each other? For the next 10 months, we planned and cooked low-cal dinners for each other. Each weeknight one person would cook and deliver the meal to the other two neighbors. I followed a strict 1,200-calorie daily diet—300 calories at breakfast and lunch, two 100-calorie snacks (one morning, one afternoon) and a 400-calorie dinner—and exercised five days a week, usually walking in the morning and again after dinner. After 6 months, we had all met our goals of losing 20 pounds. How did your girlfriends help you slim down? The real difference for me, compared to other weight-loss programs I’ve tried, was the direct accountability that we felt toward each other. It isn’t easy to lose weight, but having friends who listen—and keep you accountable—made it easier. Early one Sunday morning when Julie was away on vacation, she called me at what would have been our usual post-exercise time and asked how my workout went. I was so busted. I had to admit to her that when my alarm went off, I smiled at the thought that she was away, hit snooze and rolled over and went back to sleep. You’d better believe I stayed on track during the rest of her trip. Exercising together also helped me work through other dieting challenges. For example, if I had an upcoming event like a cocktail party, our walk would become a strategy session. We’d discuss what food was likely to be served, how I’d stay on track without calling attention to myself as the “dieter,” whether it was better to eat beforehand, what would be hard to resist. By the time the walk was over, I’d have a plan because my girlfriends had talked me through it. What was one of your challenges—and how did you overcome it? When I went back to school to get my interior design degree, I often got hungry when I was studying late at night. Instead of rummaging around in the pantry, I planned ahead for a 15-minute break that included a healthy snack. What have you learned from your diet club? It’s taught me that you can diet and eat healthy, yet still enjoy cooking and really look forward to your meals. It certainly didn’t feel like a diet; it felt like a supportive supper club. When I looked in my closet and realized that everything in it fit, I was motivated to keep up with my new good habits. I also have been able to maintain my weight loss because I now know what a 400-calorie dinner looks like. When one of us makes a large batch of food, like soups and casseroles, we often share with each other. It’s fun to keep cooking for people who love food as much as you do. I also still exercise at least 5 days a week for 30 to 60 minutes. My favorite activities include pilates, weight training and walking. What advice can you offer to other people who would like to lose weight based on your plan? Anyone can make this work. Find friends—you only need one or two—and create a plan. We chose which nights we would cook based on our family activities and what made sense for us. But if weeknights are too much for you, try cooking on the weekend, freezing meals or relying on your crock pot. As long as you have a plan, and have friends to make sure you follow it, this can work for you. What are some of your favorite EatingWell recipes? I love the Chorizo-Stuffed Pork Tenderloin and Five-Spice Turkey & Lettuce Wraps! Have you lost weight and kept it off? 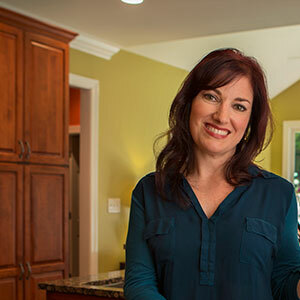 Send your story to mystory@eatingwell.com and you could be featured in our next video. Looking for inspiration? Watch how Mark lost more than 100 pounds.